One of the allures of Laos is its deeply rooted Buddhist heritage. Buddhism is the fourth largest religion in the world with over 520 million followers predominately in Asia. However there is no where in the world where the Buddhist monks are as revered and the temples as carefully tended as in Laos. 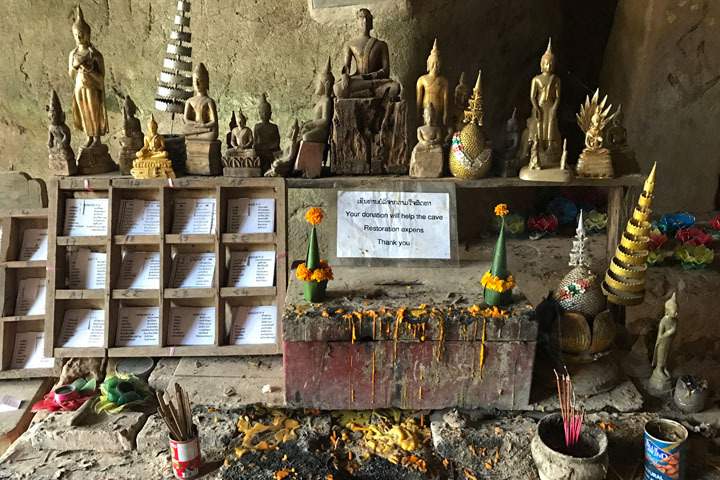 Buddhism is not just a belief system, but it is a way of life and an important part of the Lao people’s daily ritual. 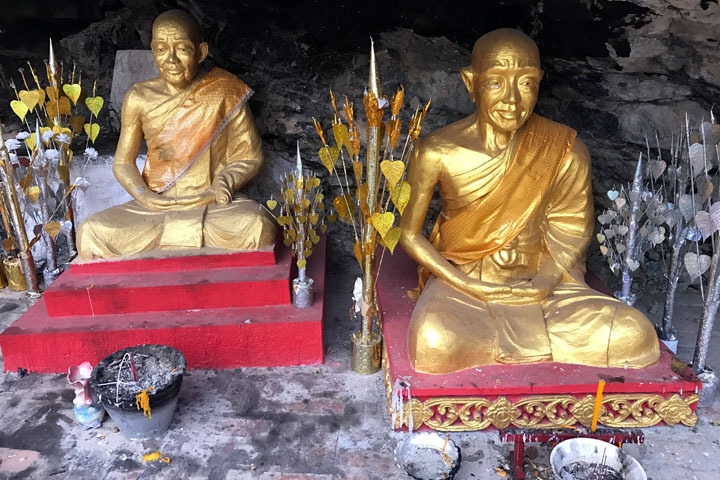 During my travels to Luang Prabang, Nong Khiaw and Muang Ngoy I had the opportunity to visit several Buddhist temples, from the very beautiful and ornate to the more humble places of worships. One of the peculiar things that struck me at some of them were the distinctive wooden boxes. 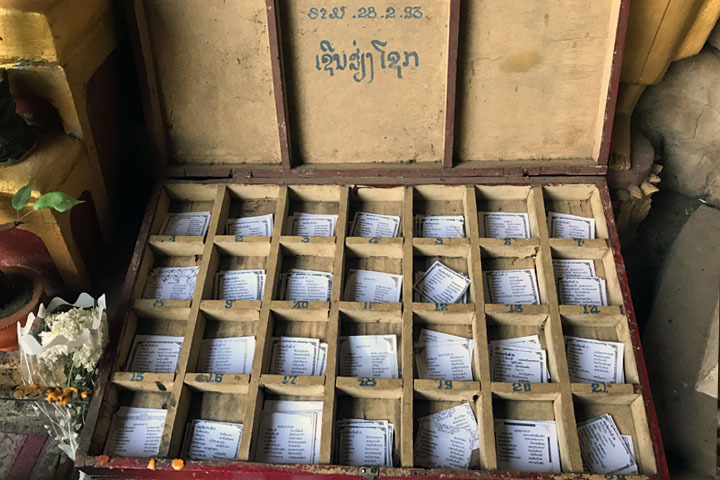 I first came across these boxes at the Wat Xiengthong temple in Luang Prabang. Inside one of the smaller temple buildings there was a striking red painted box divided into 36 compartments containing written paper notes. The compartments were clearly numbered and I presumed prayers were written on the papers, with 36 being a number of significance. I watched a worshipper in the temple take a slip of paper and fold it tightly before pressing it into the hand of one of the statues. 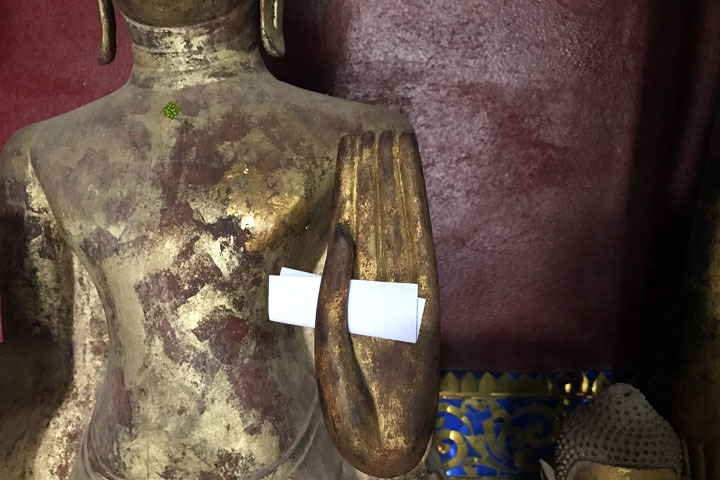 Therefore I followed suit by taking a piece of paper in compartment 6 (my favourite number) and folding it neatly before wedging it into the hand of a Buddha statue. The next time I came across a similar spectacle was at the Pak Ou Caves. These caves have accumulated thousands of Buddha statues over hundreds of years. Whilst they are not in themselves considered a temple, it is a place of worship that attracts many pilgrims. At the foot of the lower cave I observed two wooden boxes each with 12 compartments containing papers. By one of boxes was a rusty tin filled with sticks as well as candles and incense. 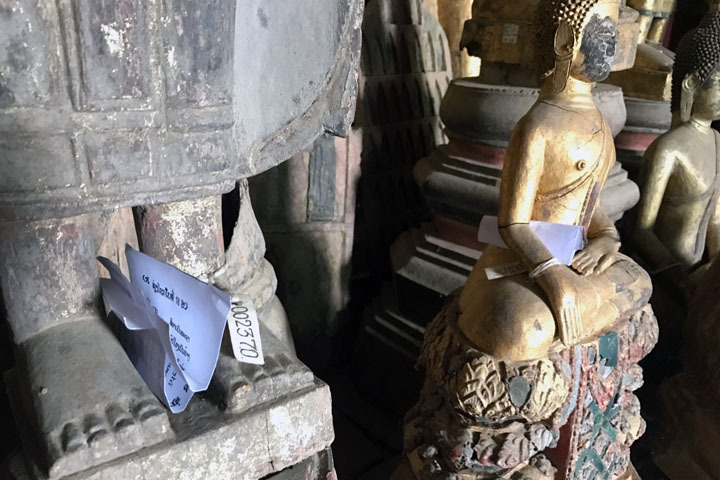 As I appreciated the many Buddha statues throughout the lower and upper Pak Ou Caves, I noticed a great deal of them had small slips of paper wedged in their fingers, toes and other body parts. Towards the end of my long weekend in Laos I made the trek up Phousi Hill to witness the famous sunset over Luang Prabang and the Mekong river. Inside the cave temple near the base of Phousi Hill I found the same style of wooden box but this time with just 28 compartments. I was curious to learn the significance of these papers however it took me a great deal of searching online and speaking with people from South East Asia to ascertain their meaning. 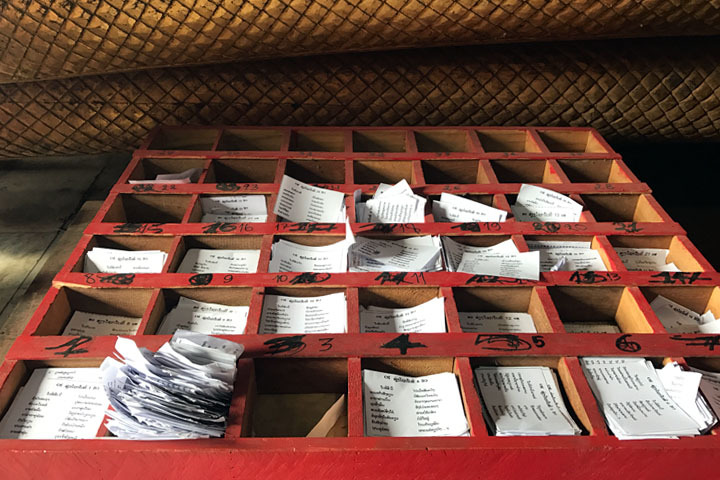 The wooden boxes are known as fortune boxes and the papers are fortune poetry. The usual practise is to shake a cylinder of numbered fortune sticks called kau cim until one falls out. The number of the fallen stick corresponds to one of the numbered papers. The papers contain lyrical notes that describes your life at the present time with the purpose of helping you reflect on how you can be better. Whereas some religious men, while living of food provided by the faithful make their living by such low arts, such wrong means of livelihood as palmistry, divining by signs, interpreting dreams… bringing good or bad luck… invoking the goodness of luck… picking the lucky site for a building, the monk Gotama refrains from such low arts, such wrong means of livelihood. 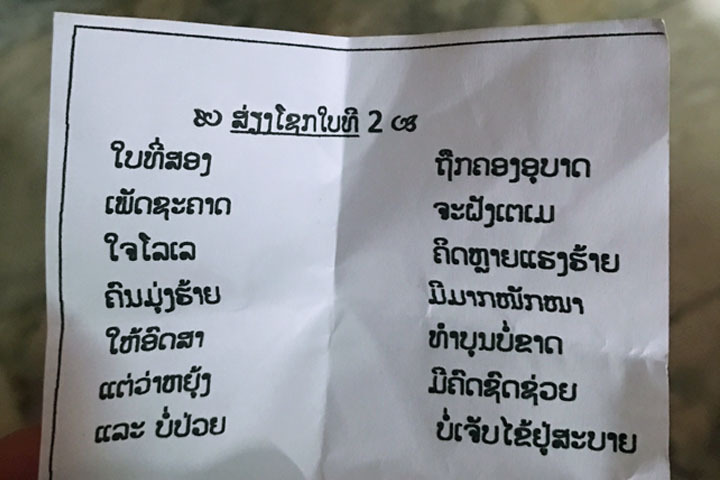 The practice of fortune poetry is not unique to Laos, and Buddhist temples throughout Asia including Thailand, Malaysia, Singapore and China will have fortune poetry boxes and fortune sticks at places of worship. Sometimes, although rarely, there are English versions of the text available. The tradition is very similar to o-mikuji, which is practised at Japanese shrines with the key difference being that o-mikuji is more superstitious and is purchased with money. 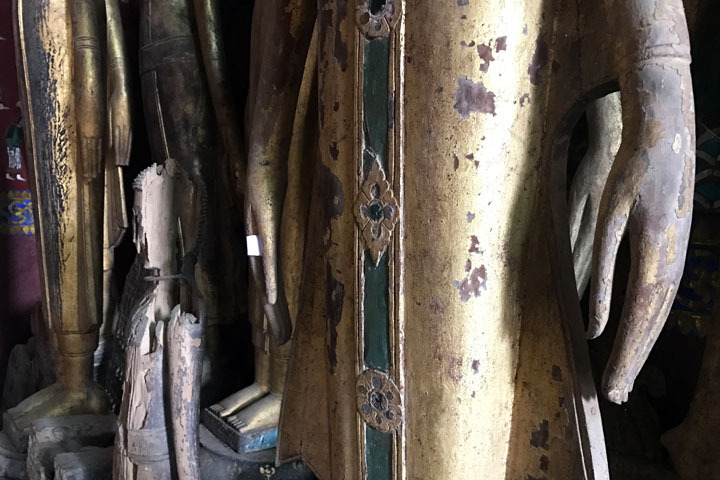 I would love to learn more about the significance of placing the fortune poetry folded into the hands of the Buddha statue. Who knows the reason why? I find it interesting that you found the meanings of the paper notes that were in the Buddhist temple. The paper notes being in red boxes are interesting in particular. I am curious to learn what some of the poems are in the boxes. I actually just learned about such practices now! From your experiences, I’ve learned more about other cultures. It’s great that you try to keep an open mind as you venture out and learn on the practices of other cultures. I would have to agree with Sheikh that the paper notes bit caught my attention and I do find it interesting. Would definitely want to learn as well! I would have to do some digging on this more.